Valves are lanceolate with obtusely rounded apices. Axial area is narrow and completely filled by the lateral raphe. Central area is small and irregular, typically bordered by alternately short-long-short striae on one or both sides. The distinctly lateral raphe becomes reverse lateral near the proximal ends, which are bent to the secondary side and distinctly inflated. Striae are radiate, becoming parallel to weakly convergent near the apices. Areolae are coarse and number 24-26 in 10 µm. These images are from a population living in Sheridan Lake in the Black Hills National Forest, western South Dakota. Here, on the sample date, pH measured 9.73 and specific conductance measured 327 µS/cm. 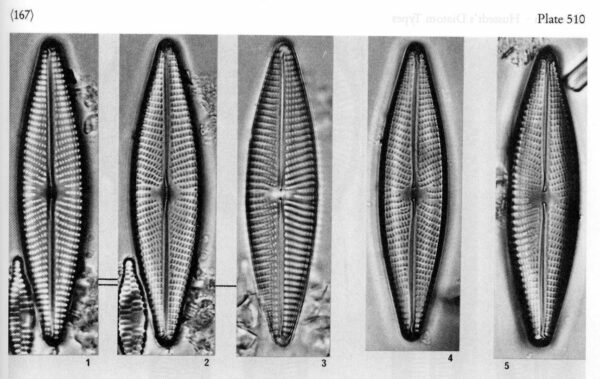 Lange-Bertalot (2001) reports this taxon from eutrophic to mesotrophic, calcium-rich standing waters in Europe. This taxon has been recorded infrequently in the United States. Schalen lanzettlich mit kaum merklich vorgezogenen, ziemlich spitz gerundeten Enden, um 44 µ lang, etwa 10 µ breit. 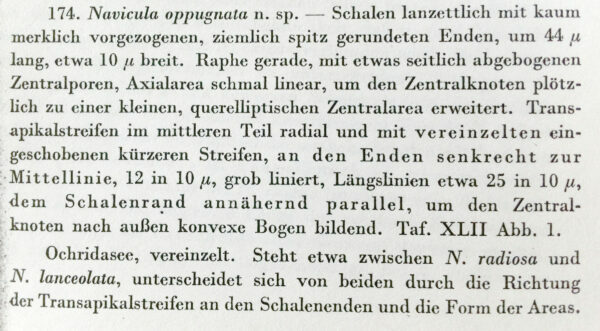 Raphe gerade, mit etwas seitlich abgebogenen Zentralporen, Axialarea schmal linear, um den Zentralknoten plötzlich zu einer kleinen, querelliptischen Zentralarea erweitert. Transapikalstreifen im mittleren Teil radial und mit vereinzelten eingeschobenen kürzeren Streifen, an den Enden senkrecht zur Mittellinie, 12 in 10 µ, grob liniert, Längslinien etwa 25 in 10 µ, dem Schalenrand annähernd parallel, um den Zentralknoten nach aussen konvexe Bogen bildend. 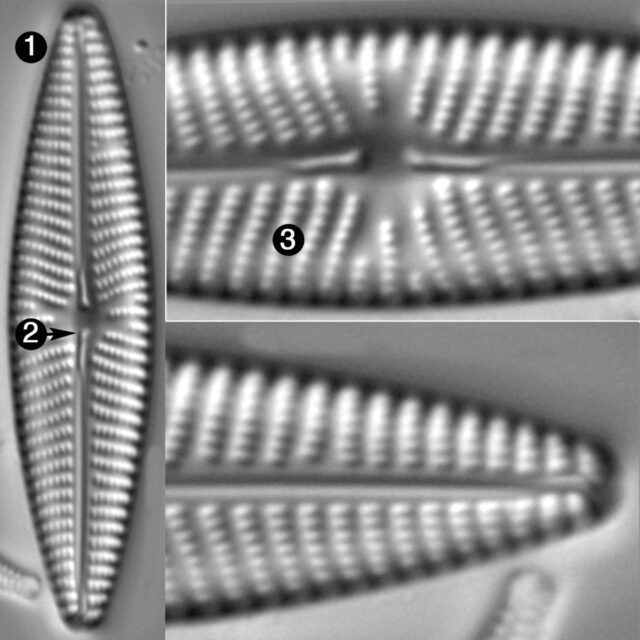 Navicula oppugnata has lanceolate valves, wider than 8 µm. Proximal raphe ends are bent to the secondary side of the valve. 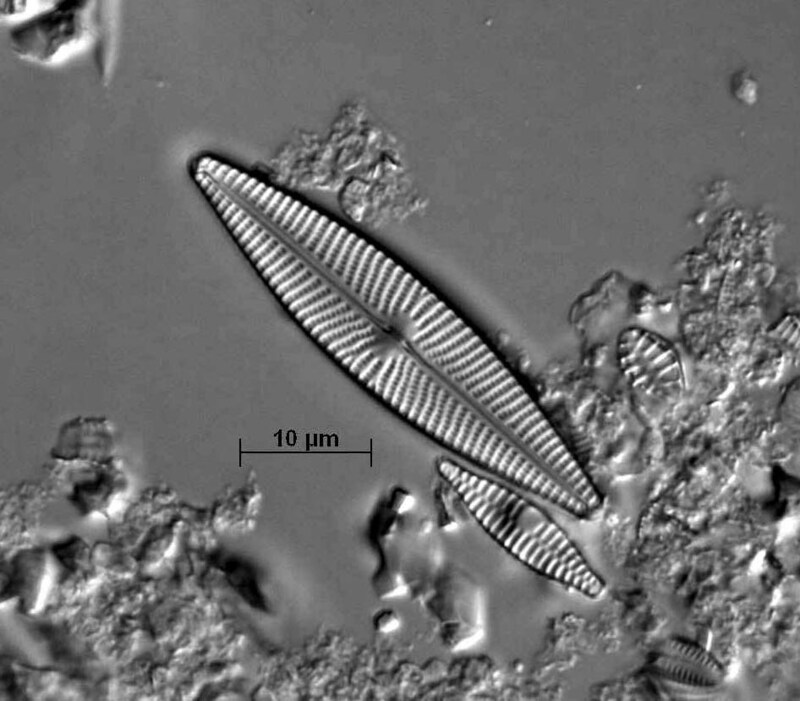 Striae are coarse and number 9-11 in 10 µm. Arolae are also coarse, easily resolved in LM and number 24-26 in 10 µm.